Have you ever gone to purchase an NMR tube and seen such words as ‘OD and ID’, ‘Camber’ or ‘Concentricity’ in the specifications? You might have thought to yourself “What are those things and why do they matter? I just want a tube that gives me great resolution.” Keep reading, for the first in a three part series on why these properties and others, are important to obtaining the best resolution for your experiment. Outside Diameter (OD): A measure of the distance across the center of the tube from the outermost surfaces. Inside Diameter (ID): A measure of the distance across the center of the tube from the innermost surfaces. Failure to adhere to strict diameter tolerances can produce undesirable characteristics in NMR Spectroscopy like the ones described below. If the OD is too small, the tube can slip and a spinning wobble may occur causing modulation sidebands in the spectra. Even more disturbing the tube may slip through the probe. If the OD is too large, the tube could make contact with the probe insert, damaging the probe – a costly repair! 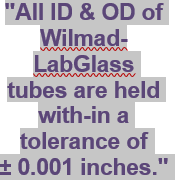 Wilmad-LabGlass measures both ID & OD over a large number of points along the entire length of the tube ensuring all tubes are held within a tolerance of ± 0.001″. These tight tolerances and strict inspection processes are what make Wilmad-LabGlass NMR tubes the only choice when you need promised performance.